Sunbury village Solicitor David Brehm swore in William Foley as a new full-time Sunbury police officer at a recent Village Council meeting. 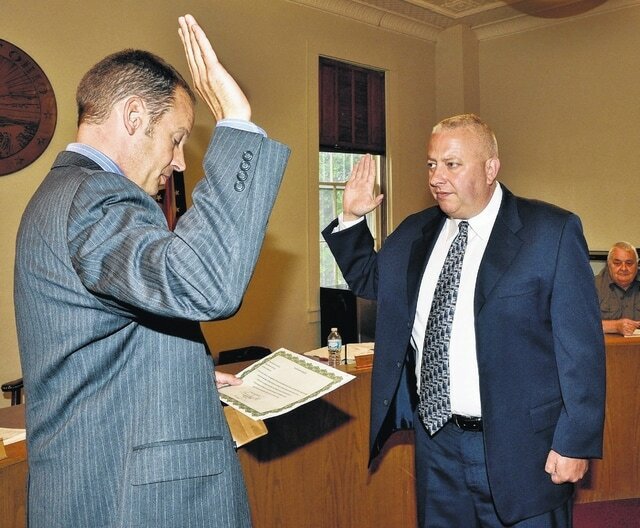 Foley comes to the village with 16 years of experience on the Mount Gilead Police Department. Sunbury Police Chief Pat Bennett said he’s excited to bring Foley on board. Council members also went into executive session for a final round of interviews with the two short-listed candidates for the village administrator position — Don Buczek and Allen Rothermel. No decision had been made on the village administrator position following the executive session. An annexation agreement and an annexation petition will remain tabled for one more council meeting. If the annexation were approved, the village of Sunbury would extend to the west as far as 3 Bs and K Road. An ordinance requesting an expedited annexation of 67.549 acres adjacent to the former Price property that’s being developed by Fisher Homes was given a first reading by council. Brehm said the parties involved are still trying to formalize an annexation agreement that must be approved before the annexation request has an up or down vote. “This may very well go to three readings,” Brehm said. Tim Clapper of CT Consultants reported that elusive storm drain lines — running from Vernon Street alley storm drops to Prairie Run Creek — had been located. Clapper said the lines require repair work behind the former Lawson’s Store; and gravel in the lines could be kept in check by installing different grates.